This is our home for 2-3 months, an island in the rice fields. bedroom window, where we watch the sun rise every morning. The third floor is a yoga/dance/graphic art studio. Ganesh greets you when you walk in the front gate. We have 3 lover cats. The view from my "office". One of the several volcanoes which created a giant crater on the island is about an hour away. this guy doesn't live at the house. In town there is a monkey forest. We have some monkey friends (Jessie and Jahred). 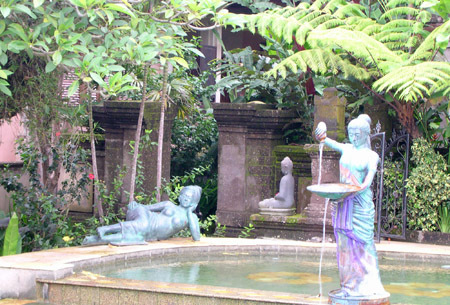 The Balinese have the most amazing sense of style and artistic abilities. This guy was about the size of my hand. We went to a a public cremation ceremony for one of the relatives of the king. This was a very intense experience for me. The body was all too clear as it hung from what was left of the big wood bull that it was placed inside. I decided to remove the more graphic photo. It's an image that I find difficult to shake. To change to a more positive note, we have had a few great days at the beach... and I am learning how to surf. We found a little oasis of a place in town that has a salt water pool.... no chlorine! It feels amazing to swim there and you don't feel salty when you get out like after the ocean.....it is very peaceful, and decorated with such intricate style and blessed by many beautiful statues of the Goddess. which revealed a most stunning view of the island and a glimpse of the neighboring islands. which melted our sore muscles and made a perfect end to an amazing day. and we look forward to seeing all of you when we return.